St.Pr.St. Ronja has given birth to the full brother to Oldenburg Licensed stallion Darnell. This colt is every bit as impressive as his big brother and oozes stallion presence. He is by the legendary Don Frederico, who was Hanoverian Stallion of the year in 2012 sire of many Champions and Grand Prix horses. For us he is the perfect colt, beautiful type, excellent conformation, powerful extravagant movement, naturally uphill, we are so excited about his future. This amazing colt takes my breath away and is the complete package and so we have named him Larkshill Definitive! Don Frederico was proclaimed Hanoverian Stallion of the Year 2012. He is by the legendary Donnerhall out of Cleopatra (by Consul). The black stallion comes from the Schwanjungfrau mare line, which also produced licensed stallion Lanthan. Don Frederico was licensed in 1999 and named Champion stallion. He sold to the Celle State Stud and did his stallion performance testing in Adelheidsdorf. He finished second in a field of 45 with a dressage index of 151.67 points. He competed at the Bundeschampionate as a 5- and 6-year old and was the first state stud owned stallion to compete in the Nurnberger Burgpokal Finals in 2006. Don Frederico's breeding success was apparent quickly. From his first crop came Bundeschampion Dantonisius and reserve Champion Dark Carlotta. Both are out of Weltmeyer dams. Several of his offspring have moved to international Grand Prix level, including German Olympic team horse Diva Royal (out of a Warkant dam). Isabell Werth's internationally competed GP horse Don Johnson as well as Elin Aspnas' Swedish Young Riders team horse Donna Romma are also by Don Frederico out of a Warkant dam. As of 2013, Don Frederico has 27 licensed sons with the Hanoverian Verband, including the 2012 Bundeschampionate bronze medallist Don Darius and the 2008 World Young Horse Champion Dramatic. He has more than 2,500 Hanoverian registered offspring, of which 205 are State Premium candidates. Ronja is a wonderful State Premium, performance tested Hanoverian mare by Rotspon. She comes from a very successful family, her dam is also State Premium mare, by the legendary stallion Weltmeyer. 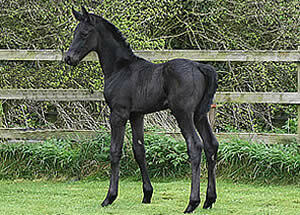 Ronja has already bred a graded Stallion just like her dam St.Pr.St. Wanja who bred the Premium graded stallion, Blue Hors Lodestar - who of course is Ronja’s brother! Ronja has a perfect pedigree for breeding dressage performance horses. Ronja achieved fantastic scores at her grading and performance test before starting her very successful breeding career. Ronja's dam St.Pr. St. Wanja was a very good sport horse in addition to breeding the Premium stallion Blue Hors Lodestar and of course Ronja and her other sisters and brothers! As a three year old St.Pr. St. Wanja out of nine competitions was placed First 5 times and 4 times Second to Fourth place. Her grandmother "Ballerina" was even better. She was First nine times and 6 times Second and 4 times third or fourth from 19 starts! Many of her Ronja's foals have been selected and sold through the Verden Elite auction. Her 2006 foal Darnell by Don Frederico was purchased as a foal by Paul Schockemöhle, went on to grade with the Oldenburg Verband in 2008 and sold in 2010 at the PSI Auction for 190,000 Euros! He has now won his Qualifier for the Germany Bundeschampionate and has earned his ticket to the finals!Her 2008 filly, Diva also by Don Frederico was Champion 2 year old and received the 1a Prize at a mare show in 2010 and is heading for State Premium status. Diva has also been awarded Champion 3 year old mare in 2011.